Fate had blessed her with a strong showing in the most recent local poll, and her confidence was so mighty that she didn't even find it necessary to accept the apology of a veteran newsman who apologized for asking her if she felt she was a flake in the wake of so many gaffes and incorrect statements leading up to her bid for the GOP nomination for president. And then it happened. A microphone was placed in front of her, and a statement that should have been ingrained in her head came out all wrong. She said that like the famous rugged cowboy star, John Wayne, she too was from Waterloo which was why she was picking the small town to announce her candidacy. "Well what I want them to know is just like John Wayne was from Waterloo, Iowa. That's the kind of spirit that I have, too," Bachmann told a Fox News reporter. One small detail: John Wayne Gacy, the infamous mass murderer is from Waterloo. The Duke, although his parents met in Waterloo, is from Iowa, but from Winterset, nearly three hours away by car. That's right. 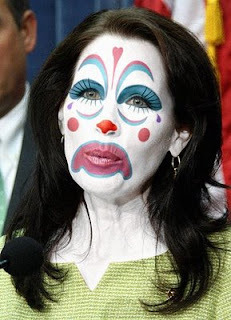 Bachmann stated she has the spirit of a serial killer in her, but when confronted with her error, Bachmann didn't own up to it - she doubled down. "Well what I want them to know is just like, John Wayne was from Waterloo, Iowa," she told Fox News. "That's the kind of spirit that I have, too." "John Wayne's parents first home was in Waterloo, Iowa and he was from Iowa and of course the main point I was making are the sensibilities of John Wayne, which is patriotism, love of country, standing up for our nation, that positive enthusiasm is what America's all about," Bachmann told CNN. "And that's of course my main point." Bachmann did not admit she made a mistake - she tried to ignore it and let it all go away and she had her campaign do some research to try and back up her mistake. CNN did report backing up her newest claim. John Wayne the movie star was born in Winterset, Iowa, which is approximately three hours Southwest of Waterloo, Iowa, Bachmann's native city and the site of her presidential announcement Monday. But according to the Waterloo Chamber of Commerce, the actor's parents did live in the city at one point. But, did you notice Bachmann's comments from Fox? She said she had the spirit of The Duke too, as in addition to a serial killer. Since Bachmann's gaffe didn't immediately go away, Bachmann felt it was necessary to finally apologize. "People can make mistakes and I wish I could be perfect every time I say something, but I can’t,” Bachmann said on CNN’s American Morning. "But one thing people know about me is that I’m a substantive, serious person and I have a strong background." So which is it? Did she screw up about John Wayne's heritage and just got lucky that his parents owned a home in Waterloo once, or was she just totally wrong? I recall another politician who recently got into some hot water for immediately denying doing something but then finally coming clean with the truth. How is Bachmann any different? I also wonder what Bachmann would say to the rumors surrounding John Wayne's sexual preference?